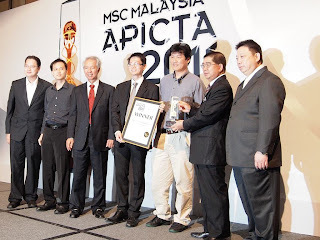 Kuala Lumpur, Malaysia – (25 Oct 2011): MSC Malaysia APICTA Awards returned for its 12th annual iteration on 25th October 2011 at the Kuala Lumpur Hilton. The Asia Pacific ICT Awards (APICTA) is an international Awards Programme initiated by the Multimedia Development Corporation (MDeC) to provide a platform for innovators and entrepreneurs in the ICT sectors in the region to benchmark their products and to network. Students, entrepreneurs, SMEs, individuals and organizations compete in 18 categories showcasing their creativity, innovation and ICT excellence in the country. Open Dynamics was selected as the Winner of Best of Startup Companies Category and its product, Joget Workflow, bagged the Merit award for Best of Applications and Infrastructure Tools. In spite of an incredibly intense competition among the nominees, Open Dynamics displayed the right industry caliber to be recognized for its achievements and contributions in the two categories. Open Dynamics is one of the very few open source product companies in Asia Pacific that have successfully proven the open source business model in the software technology sector. Its team of enthusiastic professionals is committed to developing open source products that help organizations increase revenue through business processes that can be automated and managed easily and intuitively. Today, less than 2 years since its incorporation in Malaysia, it has 22 partners spanning across the world continents, from various countries in Asia Pacific to the Middle East, Europe and the Americas. Joget Workflow is an open source workflow application builder that focuses on simplicity. It is the first among production-ready BPM software and workflow systems to offer application builder functionalities on top of workflow components. Allowing process analysts to implement process automation in an easy manner, it also empowers software developers to integrate with other systems using a dynamic plugin architecture. “In July this year, we were very thrilled to learn that Joget Workflow had been selected as a platform in the Code for America’s implementation of Open311 Center in San Francisco and accepted to Google Summer of Code 2011 initiative. 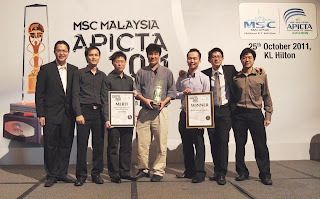 And now, we are enormously happy and incredibly excited to be awarded two prizes from MSC APICTA. Of course, this is just the beginning. Our vision to make Joget Workflow into a widely adopted platform for developing process-driven web apps has only just begun." said Julian Khoo, VP Product Development. “The timing of winning these awards is perfect as we will be releasing the highly anticipated Joget Workflow v3 in the coming month.” he added. Open Dynamics will represent Malaysia to compete in the respective categories at the International APICTA Awards 2011 which will be held from November 8 – 11 at the Dusit Thani Pattaya Hotel, Pattaya, Thailand.